Google Scholar is search engine that indexes the scholarly literature across an array of publishing formats and disciplines. It provides a very powerful means to find literature associated with pretty much any research topic you can think of. For instance, say I wanted to dig up published literature related to mathematical or computational modelling of zombie attacks. 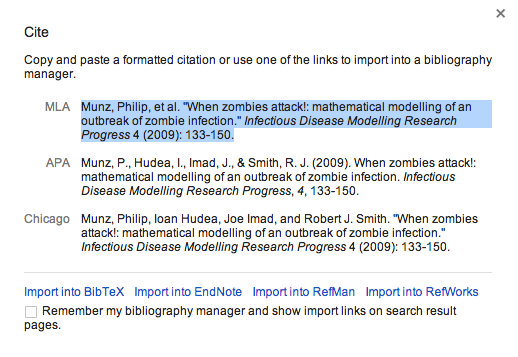 In the Google Scholar search field, I could try a term like zombies model. In this case, the first search returned is a 2009 paper by Munz et al describing mathematical modelling of zombie attacks. Note that in the lower left hand side below the citation, there is a link that says this paper is cited by 35 other papers. Sometimes you will find a paper related to a topic that you are interested in that has literally hundreds of citations. I call those “jackpot” papers, because searching through the citations can also usually yield a lot of interesting and useful papers relevant to your topic. Click on the Cited by 35 link and take a look at the papers that are listed there. Notice that there is a box near the top of the page that you can tick that says “Search within citing articles”. Tick that box. Now, in the search field, type “agent based”, and look at the papers that come up. As you continue in the MTBI programme, you will be learning how to use LaTex document formatting and typesetting program. LaTex has a really nice reference management program called BibTex, that you will also be learning to use. As you do literature searches related to your research topic of interest, you need to document all the papers you find (along with a short summary of the paper) so that you will be able to cite them later. Document *all* papers you find that you think might be related to your topic… you don’t have to cite them all in the end, but it is nice to have them all summarized in a nice format so you can easily find the citations you are looking for. Your bibtex file will consist of citations to many different papers in the above format (which is interpreted by the LaTex typesetting program). However, just the text above is not enough, because you will soon forget exactly what that paper contained. If the paper is really key to your research topic, download the PDF and store it in the folder related to your research topic. Then read the paper and write a few sentences summarizing it in your own words. Add that summary, with each line beginning with a % (the LaTex comment character) just before the bibtex citation in your bibtex file. I also find it useful to copy and paste the paper abstract into the bibtex file (again, preceded with the % comment character). A bibtex file with comments describing the paper is known as an annotated bibliography. As you progress in your research and amass many different citations in this file, you will likely want to sort them by subtopic. Don’t get lazy, and not take the time to make an annotated bibliography thinking that you will easily find the papers again, and/or remember what important content they contained! I guarantee that 9 times out of 10 you won’t. And you will likely waste a lot of time redoing work for no good reason if you decide to be lazy now (plus you risk getting a reputation for being disorganized). This entry was posted in 2013 MTBI Summer Institute, ASU AML610 Fall 2014, ASU AML610 Spring 2013 Lecture Series by admin. Bookmark the permalink.